Singapore Airlines began in 1946 as a joint venture owned by the colonial governments of Malaysia and local business in Singapore and Malaysia. It began flying as Malayan Airways Limited on May 1 1947. As the airline expanded with a fleet of DC-3’s its owners soon included Quantas and BOAC. By 1958 the airline which was now called Malayan Airlines had developed service throughout Asia. After Malaysian Independence the name of the airline was once again changed, this time to Malaysian Airlines. When Singapore separated from the Malaysian federation in 1965 the name of the airline was changed to Malaysian-Singapore Airlines. The airline continued to expand, becoming the first airline in the region to purchase Boeing 707’s. The partnership between Malaysia and Singapore in the airline ended in divorce in 1972. 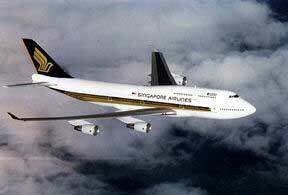 Singapore then established Singapore Airlines. Under the divorce agreement Singapore airlines inherited the fleet of Boeing aircraft, used by MSA. Even before beginning operation in 1973 Singapore airlines placed an order for 2 747 B’s. It has never looked back. Today it serves 78 cities worldwide.